Origins Modern Friction Review (2018) : Worth Buying? Origins Modern Friction , US $40 for 125 ml, is a mild exfoliator that aids in lifting the dead, damaged, and sluggish top layer of your skin on a regular basis without having to hurt your otherwise healthy skin cells in the process. “Powered by nature. Proven by science,” Origins is the all-natural brand created, formulated and managed by the industry giant, Estée Lauder. Origins Modern Friction must only be used up to three times weekly, ideally as part of your evening regimen, with the frequency of use dependent on your skin sensitivity. Always follow through with a heavy moisturizer to relieve your skin of the discomforting after-feel caused by product use. This product is rid of sulfates, phthalates and parabens which can hurt both your skin and your overall health and well-being. This product is formulated for use on all skin types. Origins Modern Friction reviews have been raving about the anti-inflammatory after-effect of this product which is instantaneously experienced right after every wash. This product contains potentially irritating ingredients that include fragrance ingredients, Methylisothiazolinone, Benzyl Salicylate, Butylene Glycol, and menthol, all of which can also cause permanent damage to your brittle, aging skin. This product is laden with the preservative, phenoxyethanol, which can severely affect your nervous system if you are exposed to toxic levels. Several Origins Modern Friction reviews show that several users have experienced skin irritations arising from product contact, making this product not ideal for use by people with sensitive and problematic skin types. 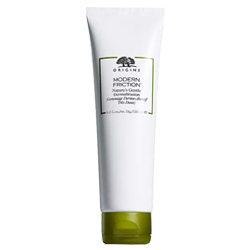 Origins Modern Friction is a moderately priced facial cleanser. Nevertheless, for these four primary ingredients, it may be too costly. Clearly, some skin types can benefit more from this product over others. If you have serious problems with hyper pigmentation and excessive dark spots or, severe forms of wrinkles, you may need a harsher exfoliation and a deeper soothing blend of skin moisturizers.